Attractive as well as structurally rigid and lightweight, the seats in the new NSX are designed to offer higher comfort and support levels than those in competing high-performance vehicles. Seat materials, such as leather and faux-suede Alcantara, were carefully selected to help provide the NSX driver with dynamic driving support and freedom of movement for spirited driving. The seats include tall bolsters with integrated support structures for improved lateral hold and freedom of shoulder movement. The Alcantara center panels in the seat bottom and seat back reduce sliding, while the leather outer surfaces improve ease of entering and exiting the vehicle. To further facilitate ingress and egress, the optional driver’s power sport seat automatically moves rearward when the ignition is turned off. The seat bottom structure is composed of stamped aluminum for reduced vehicle weight. Both the seat and seatback are of sturdy construction to hold the driver and passenger in place and for improved longevity and crash performance. The headrest is designed to accommodate a helmet for track outings. Both the driver and passenger seatbelts are equipped with an automatic tensioning system to help protect the vehicle’s occupants in the event of a collision. When an impact occurs, the automatic tensioning system tightens the seatbelts (shoulder and lap) to help position the occupant firmly in the seat within the first few milliseconds of the collision. In the event of a severe, high-speed collision, if deceleration forces rise above a predetermined level, the automatic tensioning system will release a small length of seatbelt webbing to reduce the seatbelt retention force on the occupant, limiting peak restraining forces. As the centerpiece of the driver’s tactile and dynamic driving experience, the ergonomic, seamlessly-wrapped steering wheel of the NSX provides superior grip, comfort and control. It has been designed to provide man-machine synergy between the driver and the car. 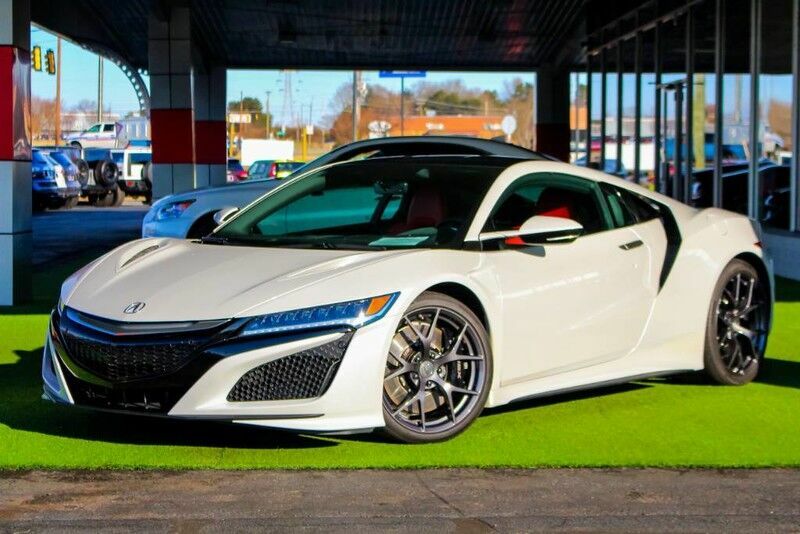 • The leather-wrapped steering wheel has a stitchless design to maximize the NSX driver's connection to the vehicle and the road. The seamless, uninterrupted surface of the wheel helps to provide the driver with predictable, linear feedback. • The shape of the steering wheel optimally supports two hand positions: nine and three o’clock and ten and two o’clock. The steering wheel shape is complemented by extended-length paddle shifters. • The flattened top section of the steering wheel offers improved forward visibility, and the flattened bottom enhances driver leg space. • The side surfaces of the steering wheel were sculpted to maximum ergonomic benefit through correlation between NSX pro drivers and interior designers. • The steering wheel inner frame is composed of magnesium for low inertia and maximum rigidity to support crisp handling. Controls mounted on the steering wheel put critical features and functions at the driver’s fingertips. The audio volume wheel, source selection button and phone controls are on the left of the steering wheel, and the MultiInformation Display (MID) controls and cruise control functions are on the right. The driver’s instrument cluster and center console have been designed to enhance the driving experience with intuitive layout and simple operation, creating a “simple sports interface” for the driver. Audio and Connectivity The new NSX makes it easy for the driver to operate the navigation and audio functions while focusing on driving. An advanced, user-friendly suite of audio and connectivity technologies is controlled by a single, 7-in. capacitive touchscreen. The Display Audio system is supplemented by steering wheel-mounted controls to put access to features and functions at the driver’s fingertips. Front and center of the instrument panel is an 8.0-in. Dynamic Thin-Film Transistor (TFT) gauge cluster, which is overlaid with a digital analog tachometer dial that resembles a traditional large analog tachometer. Within the tachometer is the digital speedometer readout and full-color MID. The TFT center meter is flanked by digital gauges displaying the Sport Hybrid SH-AWD system motor’s state of charge/assist (left) and the battery’s state of charge (right), with an analog engine coolant temperature gauge on the left and a fuel gauge on the right. Developed in partnership with Garmin, the advanced Acura Satellite-Linked Navigation System with Voice Recognition and HD Digital Traffic utilizes GPS technology to give the driver highly accurate and easy-to-follow turn-by-turn driving directions to any address in the U.S., Canada and Puerto Rico. The HD Digital Traffic system alerts the driver to current traffic conditions in their surrounding area and can display alternate driving routes (including surface streets in the U.S.) to circumnavigate heavily congested traffic areas. The driver’s center meter is tied into the Integrated Dynamics System to provide a visual complement to the customizable dynamic and auditory elements of the NSX driving experience. When the driver selects a new Integrated Dynamics System mode using the dynamic mode dial, the MID displays a graphical representation of the Integrated Dynamics System component systems, along with a color to match the mode. • In Quiet mode, the meter takes on a cool blue glow. • In Sport mode, the meter takes on a grey hue with red highlights. • In Sport+ and Track modes, the tachometer takes on a yellow hue with red highlights, and the tachometer “rotates” to place the lower and upper rpm limits at the six o’clock and three o’clock positions. As engine speed increases during driving, the outer ring of the tachometer will flash red when the engine speed exceeds 7,000 rpm to alert the driver that they are approaching the 7,500 rpm redline. The driver’s gauge cluster and Display Audio touchscreen illuminate upon vehicle entry and progressively brighten to full strength when the Sport Hybrid SH-AWD power unit is started. The display screen of the driver’s gauge cluster presents a brightly colored typeface that is easy to read against a black background. Additional interior illumination includes twin LED map lights in the overhead console and blue-tinted LED lighting for the foot wells and center console. A 7-in., high-resolution capacitive touchscreen is included as part of the standard equipment package. When the driver first opens the door, the Display Audio system touchscreen illuminates. A custom NSX animation displays when the vehicle is started. Acura NSX includes a dual-zone automatic climate control system with humidity control and air filtration. The system enables the driver and passenger to pre-select their preferred temperature settings, and it automatically adjusts volumetric airflow and temperature to maintain a proper and pleasant climate inside the vehicle. With its micron air filtration system, the dual-zone automatic climate control system can filter particulate matter as small as 0.3 microns. Push-button defrost helps to clear up fogged or icy windows quickly and conveniently for improved outward visibility. A proper and comfortable climate can help the driver keep their concentration and reactions sharp for improved safety and driving performance. Humidity control improves the vehicle’s interior air quality and occupant comfort. It uses a sensor within the cabin to detect temperature and moisture levels and regulates airflow to maintain a comfortable level of humidity. Effortless transition between driving modes is made through an elegant rotary dial. The large Dynamic Mode dial of the Integrated Dynamics System is located at the base of the instrument panel and center console juncture. The driver can easily reach the dial to change driving modes (Quiet, Sport, Sport+ and Track) without taking their eyes off the road. The rear cargo area of the new NSX is pleasantly spacious and versatile for a mid-engine high-performance supercar. With 4.4 cubic feet of space and 100 lb. of capacity, the NSX trunk can conveniently accommodate weekend luggage for two or even a golf bag—all easily accessed through the rear cargo area’s wide opening.